An Cridhe is delighted to announce a talk (with Q&A session) by Professor John C Brown (10th Astronomer Royal for Scotland), who is visiting Coll as part of the Coll & Cosmos weekend in March. As you can see from the bio below, John also likes to use magic in his talks. All are welcome. Tickets £5/person. My last paid position was as Regius Professor of Astronomy in the Dept. of Physics and Astronomy in The University of Glasgow. In this I was Leader of the Astronomy and Astrophysics Research Group, coordinator of astronomy teaching and outreach within the Dept., and lecturer on many aspects of Astronomy. In addition I am an Honorary Professor in the University of Edinburgh and the University of Aberdeen, giving a course in the latter on Honours level Stellar Physics. Having studied in Glasgow 1964-68 and joined the faculty immediately thereafter, I have been based in Glasgow throughout my career but have held many visiting fellowships abroad and am involved in numerous international collaborations. More details are in the resume pages. In 1995 I was appointed by the Queen as the 10th Astronomer Royal for Scotland, a post created in 1834. 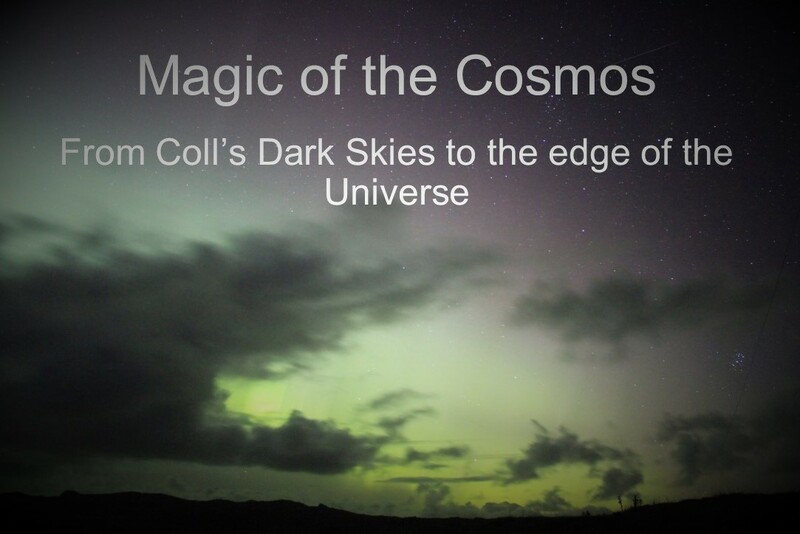 This title is an honorary one which I mainly use to promote astronomy in the public eye and in education, through lectures and planetarium shows throughout the UK, much of it via Amateur Astronomical Societies which are numerous in Scotland and in several of which I am Honorary President. I have been involved, as adviser and/or giving debut shows, in several of the new planetaria recently opened in the UK, including Glasgow Science Centre’s superb Zeiss Starmaster, Birmingham’s Thinktank, Newcastle’s Centre for Life, and for a while, the Royal Observatory Greenwich, which I quit in its pre-opening stages. More details are in the Outreach pages. In research my main interests are high energy radiation from the sun, mass loss from hot stars (including their signatures in polarised light), and mathematical inverse problems in astronomy. I have also worked on comets and meteors and on astrodynamics, especially of solar-sailed spacecraft. More details are in the Research Interests pages. My personal interests and hobbies are numerous, some of them closely interwoven with my professional and outreach work. In particular, I have always had a strong interest in arts and crafts and in the arts-science interface, so that for example my paintings and photographs often have a strong astronomy element. As a magician I make much use of my science knowledge and my public talks on astronomy make use of magic and art interests as seen in the corresponding pages.